A combative U.S. President Donald Trump insisted Tuesday "there is blame on both sides" for the deadly violence on the weekend in Charlottesville, Va., appearing to once again equate the actions of white nationalist groups and those protesting them. 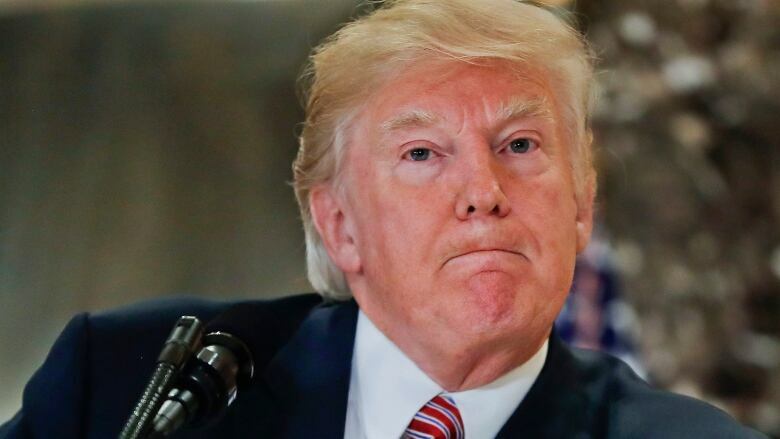 A combative U.S. President Donald Trump insisted Tuesday "there is blame on both sides" for the deadly violence last weekend in Charlottesville, Va., appearing to once again equate the actions of white nationalist groups and those protesting them. The president's comments effectively wiped away the more conventional statement he delivered at the White House one day earlier when he branded members of the KKK, neo-Nazis and white supremacists who take part in violence as "criminals and thugs." Trump's advisers had hoped those remarks might quell a crush of criticism from both Republicans and Democrats. But the president's retorts Tuesday suggested he had been a reluctant participant in that cleanup effort. During an impromptu news conference in the lobby of his Manhattan skyscraper, he praised his original response to Charlottesville and angrily blamed liberal groups in addition to white nationalists for the violence. Some of those protesting the rally to save a statue of Confederate Gen. Robert E. Lee were "also very violent," he said. He called those protesters the "alt-left." His remarks were welcomed by former Ku Klux Klan leader David Duke, who tweeted: "Thank you President Trump for your honesty & courage to tell the truth." Trump's handling of the weekend violence has raised new and troubling questions, even among some supporters, about why he sometimes struggles to forcefully and unequivocally condemn white supremacist groups. Members of his own Republican Party have pressured him to be more vigorous in criticizing bigoted groups, and business leaders have resigned from White House panels in response to his comments. Democrats were aghast at Trump's comments Tuesday. Virginia Sen. Tim Kaine said on Twitter that the Charlottesville violence "was fuelled by one side: white supremacists spreading racism, intolerance & intimidation. Those are the facts." Sen. Brian Schatz of Hawaii said on Twitter that he no longer views Trump as his president. Violence broke out Saturday in Charlottesville, a picturesque college town, after a loosely connected mix of white nationalists, neo-Nazis and other far-right extremists assembled to protest the city's decision to remove a towering statue of Confederate Gen. Robert E. Lee. Heather Heyer, 32, was killed when a man plowed his car into a crowd of counter-protesters. Trump appeared to defend both the extremists' right to protest, noting they had a permit, and Confederate statues. "So, this week it's Robert E. Lee," he said. "I noticed that Stonewall Jackson's coming down. I wonder, is it George Washington next week and is it Thomas Jefferson the week after? You really do have to ask yourself where does it stop?" Trump, who has quickly deemed other deadly incidents in the U.S. and around the world acts of terrorism, waffled when asked whether the car death was a terrorist attack. Trump said he had yet to call the mother of the woman killed but said that he would soon "reach out." He praised her for what he said was a nice statement about him on social media. As Trump finally walked away from the lectern, he stopped to answer one more shouted question: Did he plan to visit Charlottesville, the college town ravaged by the hate-filled clashes? The president's response was to note that he owned property there and to say it was one of the largest wineries in the U.S. In a statement on Tuesday, Virginia Gov. Terry McAuliffe disputed Trump's comments that both sides were to blame. "Neo-Nazis, Klansmen and white supremacists came to Charlottesville heavily armed, spewing hatred and looking for a fight," he said in the statement. "This was not 'both sides.'" McAuliffe also stressed the importance for leaders across the U.S. to denounce violence and hatred, "starting with our president." "Leaders from every corner of this nation and every partisan point of view have denounced these people and their acts in plain terms without hesitation or dissembling," he said. "The American people need the same from their president and we need it now." Trump also answered questions about his confidence in top adviser Steve Bannon by saying, "We'll see what happens." Bannon, the former leader of the conservative Breitbart News website — which he once described as "the platform for the alt-right" — has been a contentious figure in a divided White House for months and has been viewed as on the outs before. But in recent days, some of Trump's closest advisers have returned to pressing the president to fire Bannon. Speaking to reporters in Trump Tower, the president said Bannon is a friend and "a good man; he is not a racist." Trump's less than enthusiastic defence called into question Bannon's own assessment of the situation: He had been telling people that he believed his job was safe, following a conversation in recent days with new chief of staff John Kelly, according to a White House official who demanded anonymity to discuss personnel matters.